Protection – Our technicians will drill a series of holes around your building, penetrating the soil where termites are able to thrive. They will then pour appropriate amounts of liquid termicide into the holes, saturating the surrounding soil, to form a protective barrier around the base of the building. Prevention – make sure that scraps of waste wood are removed from your site and do not store firewood or timber close to the building, as these will attract termites. Ensure that branches of trees do not come into contact with any eaves of the building and that any plants and vegetation are not growing against walls/foundations, as termites may use these as cover and a bridge into the building. Make sure that external taps and air conditioners do not drip and produce patches of wet soil, as termites are attracted to the moisture. Do not delay – Termites can cause substantial damage to your property, so call in professionals at the very first signs of termite activity. Drilling – 2cm holes will be drilled through the cemented floor surface at the lowest floor level (e.g. ground floor). The holes are located slightly away from the vertical wall surface and are spaced at a regular distance apart, depending on the chemicals used and the applicability of the site. The positioning of the drill-holes are determined by the surveyor and finalised on-site by our technicians. Injecting – Termicide is then injected into the holes and the hole is sealed using a cement mix, or another suitable sealant. The sealant is coloured to match as close as reasonably possible, the surrounding floor surface. Warranty – 3 or 5 years depending on your requirements. 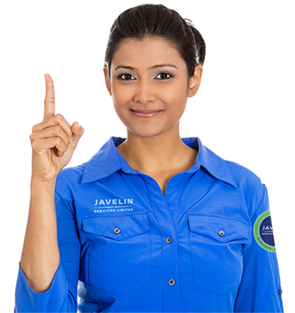 If termites infest your property within the warranty period, Javelin Services will return, free of charge to eliminate the termites.